Tucked at the end of one of the longest cul-de-sacs in New Canaan, this meticulously maintained and expanded 10-room charmer sits on a pristine 1.46 acres of property on the west side of town. NEW CANAAN — Tucked at the end of one of the longest cul-de-sacs in New Canaan, this meticulously maintained and expanded 10-room charmer sits on a pristine 1.46 acres on the west side of town. This west side Cape has been continually renovated by its current owners since the early 1980s, adding custom woodwork, high-end appliances and an entirely new front entry. 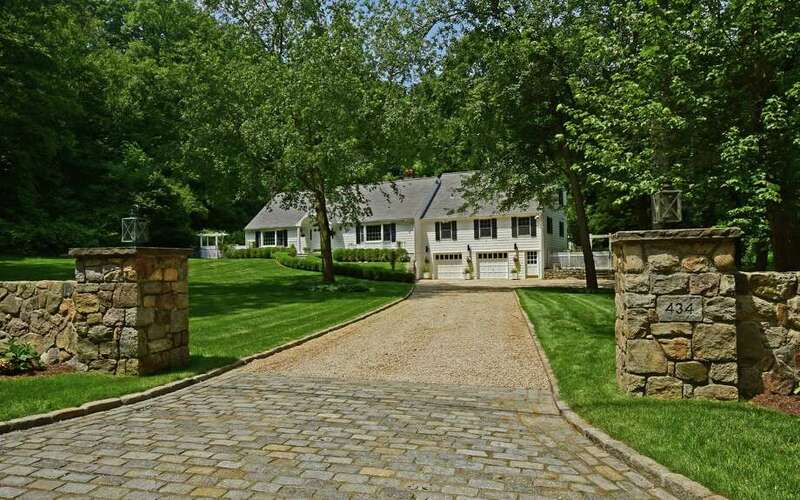 With great curb appeal, the Belgium block drive is approached through a New England stone wall with pillars. From its extensive perennial gardens, mature trees and specimen plantings, the property is quite lovely. A heated Shoreline pool and spa is enhanced with a trickling waterfall creating even more beauty in an already serene setting. Inside the double-entry doors, a foyer is lined with slate flooring and crisp, white paneling. At left of entry is a formal living room with cathedral ceilings, a wood-burning stone fireplace and a wet bar. A set of interior French doors open into a sun-drenched solarium with three walls of windows overlooking a broad sweep of the property. At right of entry is an oversized formal dining room with a wood-burning fireplace with a brick surround, dental crown molding and a large bay window. A cozy family room features a wood-burning fireplace and two sets of French doors leading to the backyard. The renovated eat-in kitchen features granite counters, top-of-the-line appliances, including an Asko dishwasher, Sub-Zero refrigerator and freezer, and Wolf self-cleaning oven. NOTABLE FEATURES: Shoreline heated pool and spa, two-car attached garage, three fireplaces, solarium, deck, generator, wet bar, terrace, shed. The first floor also features a private guest bedroom, including its own full bath, offering an alternative master suite. A custom-paneled stairway leads up to the second floor, which features five bedrooms, including a master suite. The smallest of the four guest bedrooms would lend itself as a wonderful nursery or possible office space with its own full bath. Each of the guest bedrooms has a panoramic view of the property’s extensive landscaping, perennial gardens and pool area. The master suite includes two walk-in closets and marble en suite, both with skylights welcoming plenty of natural light.